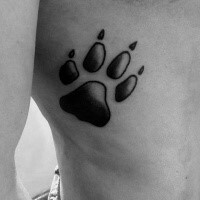 This type of tattoo is usually the most cute and simple. 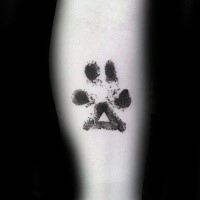 People, who decide to make a paw print tattoo, often have their own reasons. It can be made in memory of beloved pet, to emphasize some character traits of person or even membership of some social groups. 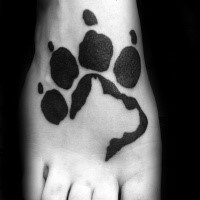 Range of paw tattoo design is very broad – different animal paw prints can vary not only in size and color, but have its unique features like religion symbols or dates of birth and death. 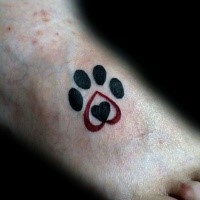 Very often you can get a paw tattoo even in case you don’t have any animals, but want to represent some thoughts or emotion of yours. 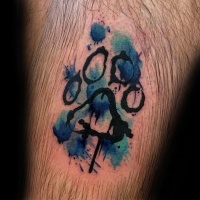 Series of paw prints can be put anywhere sometimes above surgery scars to show your desire to move forward from hard times. For different nations certain animals are sacred, as wolf for Native American. 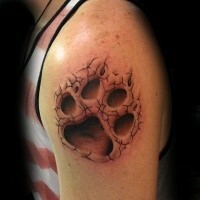 So they like to have tattoos with symbols of beloved animal. 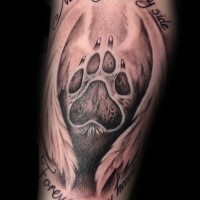 Someone prefers to have a tattoo of own children paws – to remember the most precious moments when kids where little and cute. 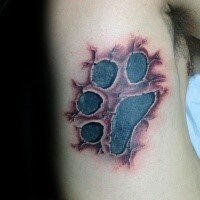 Let’s try to determine the most common paw print tattoos and cases when they are the most appropriate. 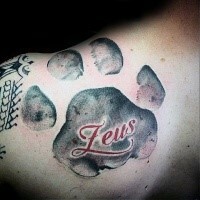 Dog prints tattoos are usually made in memory of pet or just in case of big love for canine. 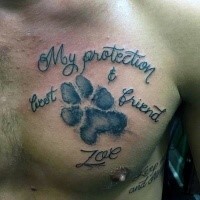 The most wonderful thing in this kind of tattoos is the possibility to make real print of your dogs paw and make a real size tattoo and complete it with full pets name or its initials. 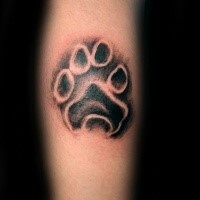 Usually dog print tattoos are made by cheerful, friendly and outgoing people. 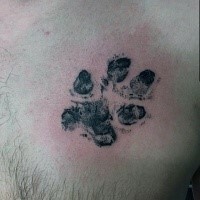 Sometimes people get dog prints tattoos in one group of friends to immortalize friendship or memories about some trips and adventures. Among canines we can found wolf and foxes too. 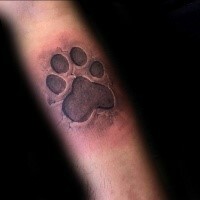 As for fox paw prints tattoo – it is not as popular among animal lovers as dogs and wolf prints. 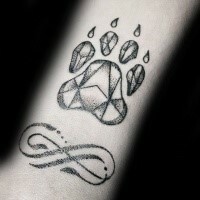 May be it can be explained by the fact that foxes are very beautiful creatures, so people prefer to have color tattoos of the whole fox or its head but not only paw. 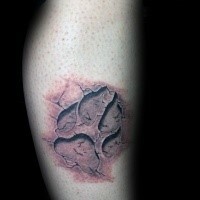 The other deal with the wolf paw tattoos. They are very popular among strong, lonely people who got a tough life and match the definition of “lonely wolf”. 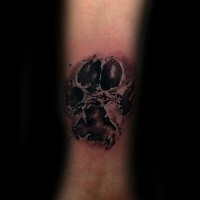 Cat prints are usually smaller and gentler then others, so they often become a choice for women tattoo. 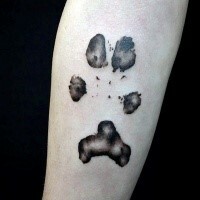 Series of cat prints are often can be found on upper hands and lower part of legs. And don’t think that series are must be in one black or brown color. The most unique tattoos are made with different colors and attachments. 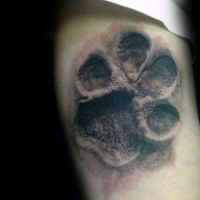 And don’t forget, that this animal differs both by its independence and tenderness, so its paws will represent these qualities in tattoo owner. It happened that not only domestic cats are actually a cats. Among the most popular cats are lions, tigers and panthers as well. 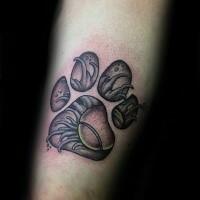 Their paw print symbolize strength and power, sometimes their owners are soldiers or sportsmen who achieved some great goals.Lion or tiger paw print is much bigger then cats one, and have some sharp fangs, which make this tattoos more aggressive and masculine. 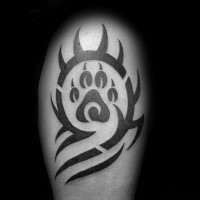 And don’t forget that lions paws represent the power of Animal king – so this is perfect tattoo to one who is a real king of company or his house and family – compatible both with men and women. 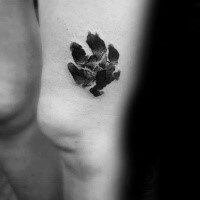 Everything is not so simple with a bear paw tattoo. 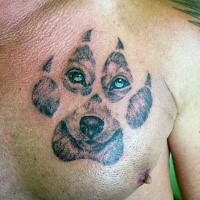 It can represent power of bear as well as comprising in the “bear” gay community. 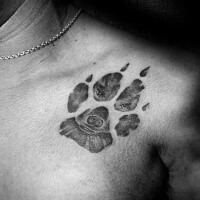 So if you just love bears or you want to memorize one bear-like person, it preferred you put initials or name near the bear paw tattoo. As for gay community of “bears” – hairy gay men who protest against general opinion about gay femininity – they like to choose rainbow colors for the paw tattoo. 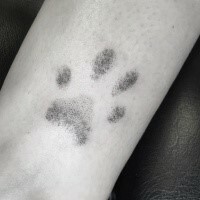 So there is no difference what animal paw print tattoo you will choose – will it be very cute and funny, or serious and strict – it will represent your best qualities or help to remember some persons and animals for sure.